Qualcomm Technologies’ 11ad Wi-Fi allows users to download and share 4k videos in seconds, sync their photos, videos and other files with blazing speed, and enjoy fast access to cloud services. Moreover, when users connect other devices, such as laptops, with the phone’s Wi-Fi hotspot feature the Snapdragon mobile platform is designed to provide end-to-end gigabit wireless connectivity with 802.11ad access and Gigabit LTE backhaul, on a compatible network, even in crowded places such as airports. Like the upcoming 5G NR standard, 11ad utilizes the mmWave spectrum – in this case, the 60 GHz band— tapping into a massive amount of data-carrying capacity that complements existing cellular and Wi-Fi networks. Additionally, ZenFone 4 Pro users will enjoy robust Wi-Fi connectivity using Qualcomm Technologies’ integrated 802.11ac 2x2 MU-MIMO technology, which offers twice as much throughput as 1x1 Wi-Fi and improved coverage, especially in buildings with brick or concrete walls. 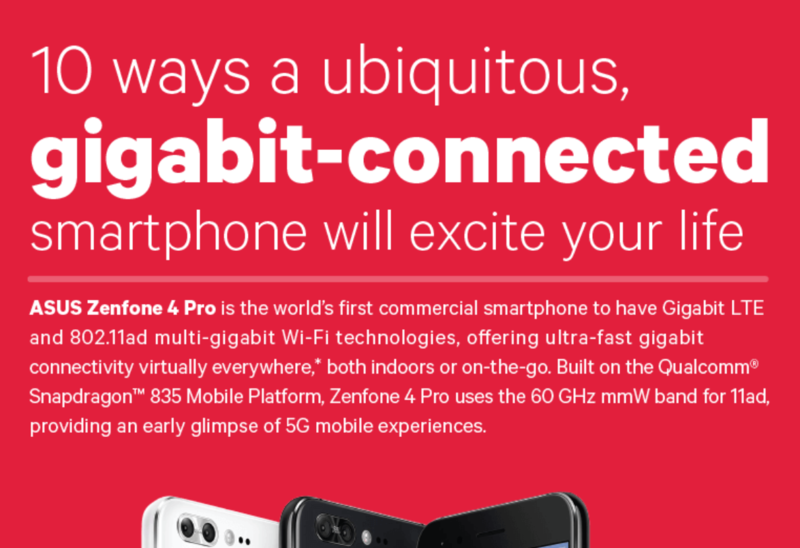 Clearly, the previous descriptions and "Zenfone 4 Pro uses the 60 GHzmmW band for 11ad, providing an early glipse of 5G mobile experience" indicate that the phone will support WiGig and 802.11ad transmission standard. I was a bit excited as it has been a long time since LePhone claimed they are the first phone supporting 802.11ad, yet disappointing me that they actually do not support it. I bought the AD7200 router which supports WiGig transmission, and yet I have no device to really use and test it. For a moment, I thought, great we (as customers) finally have something to play with. But then when I went to Asus official website, I did not saw anything about WiGig or 802.11ad in the device tech spec. I asked the customer service, and the answer is both expected and disappointed. All in all, Qualcomm is "lying" and Asus ZenFone 4 Pro doe NOT support WiGig (or 802.11ad).